I told the student to pull into pit lane and put the car in neutral. I then asked him to pretend he was braking for Turn 1, which he did: he pushed down on the brake pedal. I asked him to pretend he was finished braking and turning into Turn 1, which he did: he popped his foot off the brake pedal, and turned the steering wheel. And that was the problem: the way he released the brake pedal. I talked to him about slowly releasing the brake pedal, and the reasoning behind it (smoothly controlling the weight transfer). I had him practice slowly releasing the brake pedal pressure a number of times while sitting in pit lane, and then out we went again on the track. As we approached Turn 1, I reminded the student to slowly release the brake pedal. As he got to the turn-in point, I said, "S-l-o-w-l-y release the brakes," and he did. And he hit the apex. He did the same at the next corner as well, and the one after that. While driving with the other instructor (and on my first two laps of observing), the student had been releasing the brakes so quickly that he unloaded the front tires to the point where he couldn't get the car to turn enough to hit the apex. The student wanted to hit the apex, but he couldn't get the car to go there. In fact, he was so frustrated he almost wanted to quit. By focusing on fixing the core of the problem - the brake release - he hit every apex, immediately. And had a big smile on his face. The moral of this story is not so much about the importance of smoothly releasing brake pedal pressure as you turn into a corner (although that's not a bad thing to take away from this article), but it's really about the importance of identifying the real cause of a problem, and then solving it. In this real-life example, telling the student to turn more to clip the apex of a corner did not help because that was not the core of the problem. It's a bit like taking an aspirin for a headache. The pain reliever fixes the symptom, but not the cause of the headache. As an instructor, fix the cause, not the symptom. It's also like an onion. 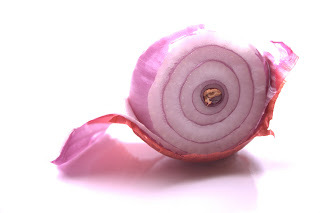 When a student has a problem (such as missing apexes), peel back the layers of the onion, looking for the core of the problem. Ask yourself, “What’s the real problem?” Trying to fix the outside layer of the onion won't get you the result you, and your student, want. It may even lead to tears. I used to brake so hard, I was standing on the brakes trying to shorten my braking distance and making a mess of the turn-in in the process. I figured out on my own (took me 5-6 years!) that I was faster if I braked earlier and lighter. I started carrying more speed through the turns and my exit speed was a lot better. I wish I'd had a coach like you at the time so I would have figured this out much faster. Every piece in the Instructor Series so far has been a real eye-opener. I am a huge fan! Ross your point is well taken. Too often the manifestation is what a cure is sought for and not what the manifestation or symptom is trying to show you. To me the key part of this article is when you took some laps *to simply observe*. You don't know where energies should go and in what dose and how they should go until a real and thorough evaluation is made. Thanks for this.